Dr. Anthony Thiselton’s thorough approach to the growing discipline of hermeneutics takes account of a comprehensive range of theoretical models of reading and interpretation. He evaluates both the foundations on which they rest and their practical implications for Old and New Testament reading. Building on his earlier influential work, The Two Horizons, Dr. Thiselton examines theories of texts, semiotics and literature, the legacy of Patristic and Reformation hermeneutics, and the use of socio-critical theory, liberation theology, and Marxist, feminist, and black hermeneutics, and discusses every major hermeneutical theorist. 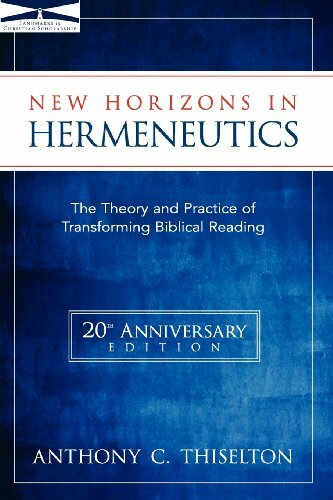 This exhaustive and rigorous critique will prove valuable to anyone undertaking advanced research in hermeneutics, including teachers and students of theology and language or literary theory.